Fruit and sorbet represent an irreplaceable tandem that contributes endless possibilities. 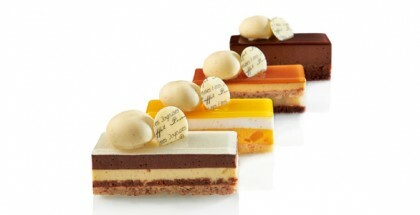 In pastry, in addition to the direct sale from the display case, fruit sorbets can be part of the classic bombes or ice cream cakes. A very practical resource for making various sorbets quickly and easily is the preparation of a basic syrup, to which we add the amount of fruit or juice suitable in each case, as well as sugar or water that may be needed. We will take into account the different serving temperatures, -11ºC in the case of serving the sorbet from a display case, and -18ºC in the case of the sorbet that is part of a cake or bombe. We will balance the basic syrup based on these different temperatures. My personal recommendation is to make citrus and other fruit sorbets from individual and specific formulas in each case, especially for medium and large productions. But I understand that for small productions, in times of low sale, or to satisfy a sudden last-minute order, having a syrup base ready that allows us to quickly prepare any fruit sorbet can be enormously practical. I will try to summarize as clearly and simply as possible the advantages and disadvantages of this system, and each professional can make the decision to use this method or search for the individual formula for each type of citrus or fruit sorbet. It is very quick and easy. Just pasteurize a quantity of syrup and store it in the refrigerator at 4ºC. Preservation does not present major problems, since the syrup is only composed of water, sugars, neutral stabilizer, and lemon juice. In sealed and aseptic containers, we can keep it for several days and even weeks. This allows us to have a syrup at all times, which means we only need to weigh the required amount, add the fruit, mix or grind, depending on the type of citrus or fruit chosen, and immediately put through the ice cream machine, obtaining the desired amount of sorbet. Citrus and fruit sorbets in general, made with a syrup base, are creations that always require commitment. At the time of formulating this syrup, it is necessary to take as a reference a fruit of average characteristics, in terms of acidity and sugar. Obviously, these preparations do not have the precision of an individual formula, balanced for each type of fruit. Not all fruits contain the same percentage of sugar, or the same acidity, or the same amount is needed, which can occasionally cause that the sweetness and PAC not be exactly the same in all sorbets made with a syrup base. In any case, we will remedy this inconvenience by formulating the syrup base with slightly less sweetness, which will allow us, if necessary, to add a little sugar at the moment of incorporating fruit. Otherwise, it would be impossible to remove sugar from both the previously prepared syrup and from the fruit itself. Another drawback is that not all citrus fruits need the same amount of neutral stabilizer. We know that strong acidity somewhat deactivates the effectiveness of the neutral stabilizer, and as the syrup is formulated on a basis of fruits of average characteristics, it is possible that fruit sorbets with high acidity present a somewhat drier texture than the others. We will deal with the formulation of a syrup base that minimizes to the maximum the above-mentioned disadvantages and that, in spite of them, it helps us create in a simple and practical way quality citrus sand fruit sorbets. It is essential, before beginning the formulation, to know the characteristics of the fruit sorbet family and the function of the ingredients that compose it. The main characteristic of sorbets is the absence of fat and milk powder in their composition. This absence stimulates the sensation of freshness of these creations and conserves the genuine flavor of the fruit that compose them. 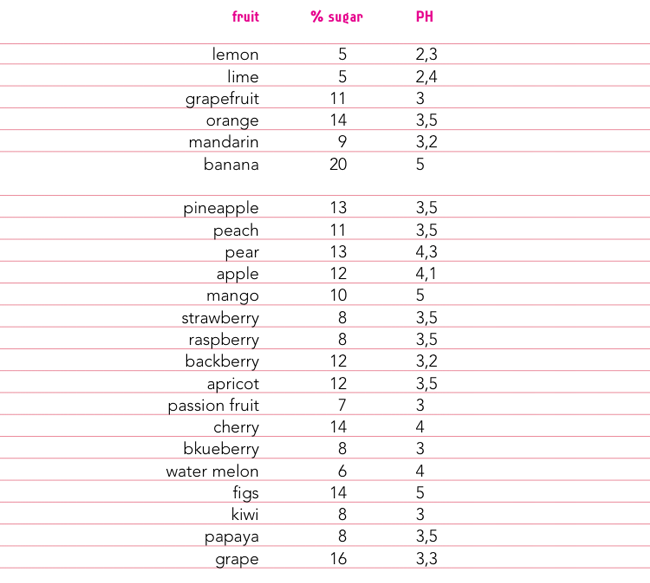 Almost all fruits have a P.H. (Acidity) of less than 5, which avoids having to pasteurize them (bacteria do not survive in an environment with a P.H. less than 5). The fact that there is no obligation to pasteurize fruit contributes to their preservation of their original flavor and prevents them from acquiring the “cooked” flavor derived from heating (85ºC) in the pasteurization process. We must, therefore, incorporate citrus fruits or juices into the syrup at 4 ° C, once it has already been pasteurized. Another significant feature of sorbets relates to the absence of powdered milk in its composition. We know that milk powder contains lactose as the main ingredient (about 50%). Lactose is a sugar, the only one of animal origin, although it has little sweetness (16%) has an anti-freezing point (PAC) equal to that of sucrose, that is to say 100. Ice cream has about 10% milk powder. Of this amount, half is lactose, i.e. 5%, which in terms of PAC equals 5% sucrose. If we want to keep the same texture in sorbets as in ice cream, exposed in the same case under the same temperature, we must compensate for the lack of PAC that lactose provides ice creams and which we do not have in the sorbets. This compensation is due to an increase in sugars, which, while increasing sweetness, is not a defect in the case of sorbets, but rather the opposite. 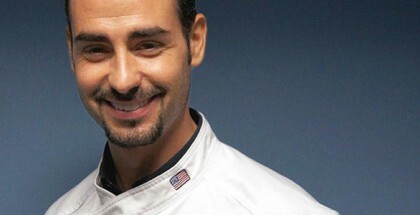 The perception of sweetness is not the same in creams as in sorbets. 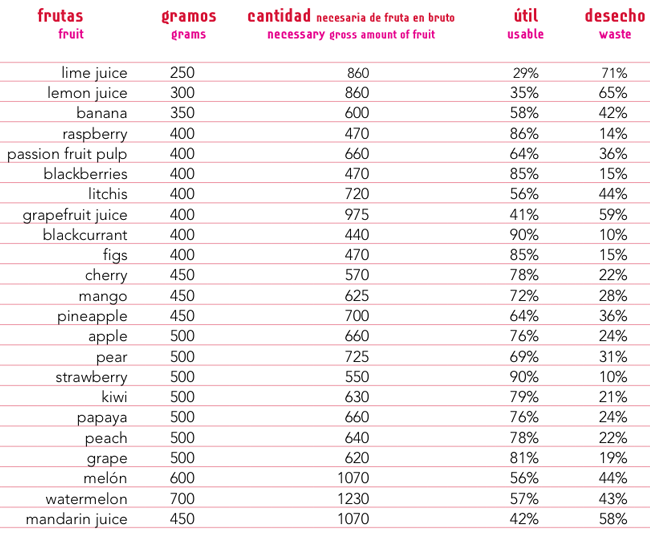 A reasonable increase in sweetness enhances the flavors and color of fruits. 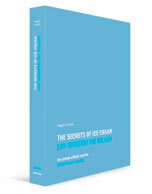 In summary: To balance the PAC of the sorbets with that of ice cream and compensate for the absence of lactose and other solids in its composition, we have to increase the sugars and consequently the sweetness between 5% and 8%. Personally, I recommend increasing by 6%. If the sweetness (POD) that we have assigned in ice cream is for example 18%, then the sweetness of the sorbet will be 24%. Of course, the total of the PAC will be the same in the cream as in sorbets. Water: The water has to be drinkable, transparent, without odors and flavors. If there are doubts, we will use bottled mineral water. Sugars: The necessary sugars are sucrose and dextrose. Dextrose, in addition to avoiding the crystallization of sucrose, has antibacterial properties, which in sorbets with unpasteurized fruit is an added advantage. We will take into account the sugars contained in juices, fruits and fruit pulps, and we will assign the same parameters as those used for sucrose in the calculation of sweetness and PAC. Neutral Stabilizer: The choice of neutral stabilizer is of vital importance. The dosage must be accurate and mixed with sucrose before use. Remember that in order to use it, the neutral has to be pasteurized and matured. With heat dispersing all its molecules in the cold mix, at 4 ° C, during ripening, it absorbs water, collects air and causes the syrup to become viscous. Lemon Juice: It is always good practice in making fruit sorbets to add a little lemon juice to the syrup after it has been pasteurized and cooled. The lemon juice brings freshness, is antibacterial and antioxidant, and enhances flavors and aromas. Of course, at the time of making a lemon sorbet with a syrup base we will take into account the amount of lemon juice that it contains. When formulating we have to be very clear that the proportion of the syrup will be 500 g in each kg of mix, and the remaining 500 g we provide at the time of making the sorbet. If the amount of fruit or juice that we provide, because of its acidity or strong taste is less than 500 grams in a kg of mix, then we will fill those 500 grams with water. 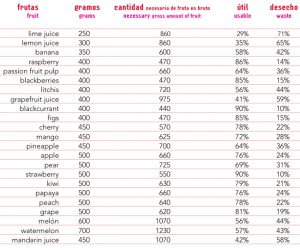 The proportion will always be 500 grams of syrup + 500 grams of fruit or fruit + water, until getting the 1,000 grams. The 500 grams of syrup represent 17% of sweetness and 200 points of PAC in a kg of mix. The total of the sugar contained in the fruit or juices added has to reach 70g, so that when we mix the syrup and the fruit we get 24% sweetness and 270 antifreeze power points. 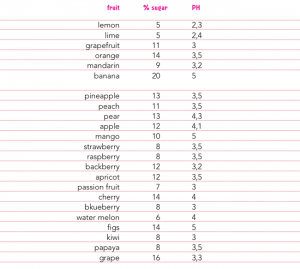 If the sugar contained in the fruit is less than 70 g, then we complete this amount by adding sucrose. The 350 grams of bananas provide 70 g of sugar and therefore there is no need to provide sucrose. The sugar contained in 400 g of raspberries is 32 g, to which we have added 38 g of sucrose to complete the 70 g of sugar. Finally, we will add 62 grams of water to reach the 500 g we need. Pour the water into the pasteurizer and start with maximum agitation. Add the dextrose. Incorporate the neutral mixed with sucrose and the rest of the sugar starting from 40ºC. Return to normal agitation and complete the pasteurizing cycle. Once the syrup has cooled to 4 ° C, add the freshly squeezed lemon juice. Pack in hermetic and aseptic containers and store in the refrigerator. 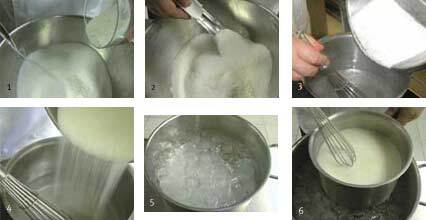 While cold, mix the water and dextrose with a manual whisk. Put the mixture in a saucepan to heat. From 40ºC incorporate the neutral mixed with sucrose. Mix with the whisk and heat to 85ºC. Cool as quickly as possible. Once the mix is cooled to 4ºC, add the freshly squeezed lemon juice. Pack in hermetic and aseptic containers and store in the refrigerator. Weigh the amount of syrup needed. Add the juice of the freshly squeezed citrus, water and sugar if the formula indicates, mix with a grinder, and immediately put in the ice cream machine. 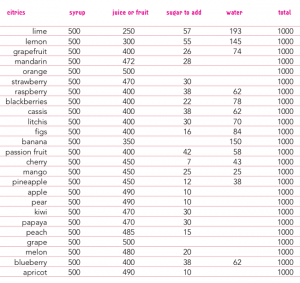 The quantities indicated in the table are valid both for prepared syrups for sorbets that will be served from display cases at -11ºC, as for sorbets that will be kept in a freezer at -18ºC (ice cream cakes). 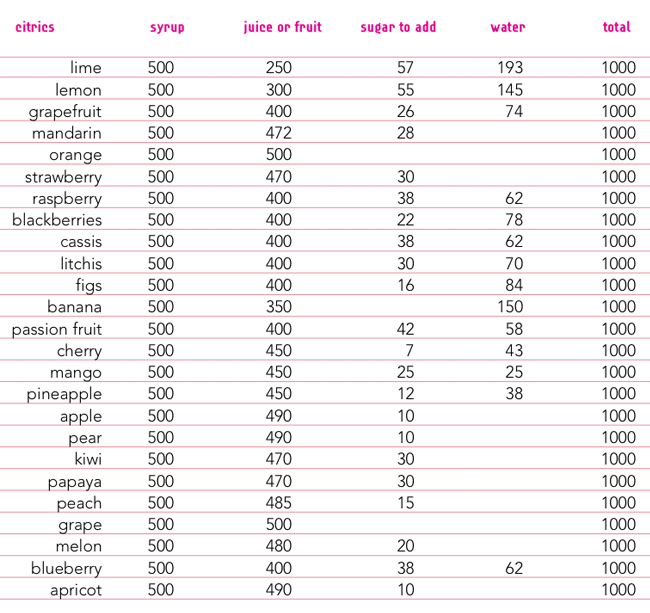 The indicated amount of juice or fruit, according to flavor, is added to the 500 g of syrup and is completed with the sugar and water necessary in each case. In summary: In the creation of citrus sorbets, it is very important to take advantage of skin grating, except for grapefruit. The grated skin will add the pleasant characteristic aroma of citrus. 2 g to 4 g of grated skin are enough to aromatize the mix. If we have water as in the case of lemon or lime, we will warm it with the grating that we will then pour and cool before adding to the mix. If we do not have water as in the case of orange sorbet or tangerine, then we will heat some juice that also has to be strained and cooled before incorporating it into the mix.